The Samsung Galaxy Grand comes with the default Jelly Bean Gallery which, as you'd imagine, has been treated to some TouchWiz flavor. It opens up in Album view, which is what we're used to seeing. Rather than the familiar stacks, the app uses a grid of photos, two on a line. Besides Album view, photos can also be sorted by Location, Time, Person (photos with tagged faces) and Group. Getting inside an album displays all the photos in a rectangular grid, which is horizontally scrollable. When you try to scroll past the end, the photo thumbnails will tilt to remind you you're at the bottom of the list. When viewing a single photo, you'll find several sharing shortcuts and a delete button above the photo, while below is a line of small thumbnails of all other photos in the album. You can tap those small thumbnails to move to other images or you can just swipe sideways. The Gallery also supports highly customizable slideshows with several effects to choose from, as well as customizable music and speed. You can also highlight specific images to be included in the slideshow. When viewing a photo with people's faces in it, the Galaxy Grand will try to detect them automatically (and you can manually highlight faces where it fails). Buddy photo share will use your contacts' profiles to try and recognize people automatically. The Galaxy Grand employs the same TouchWiz-ed music player as the Galaxy S III. Samsung has enabled equalizer presets (including a custom one) along with the sound-enhancing SoundAlive technology, which features 7.1 channel virtualization. The company also uses SoundAlive in some of their MP3 and Android-powered media players. The music is sorted into various categories and one of the options, called Music square, is quite similar to the SensMe feature of Sony Ericsson phones. It automatically rates a song as exciting or calm, passionate or joyful and places those tracks on a square (hence the name). From here, you can highlight an area of the square and the phone will automatically build a playlist of songs that matches your selection. The Galaxy Grand player is DLNA-enabled, so you're not limited to tracks on your handset - songs on devices connected to your Wi-Fi network are as easy to get to as locally stored songs. If you've enabled the Motion gestures, you can mute and pause a track by placing the phone face down. The video player offers several view modes - grid, list, folders and nearby devices (which lists DLNA devices). The video player on the Grand features Pop up play - it moves the video in a small floating window and you can use other apps on the phone with the video on. 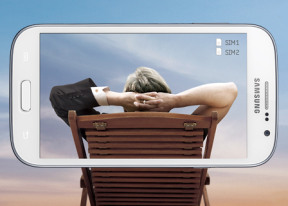 You can pinch-zoom the video window to adjust its size. The video player lets you choose between three view modes for how the video fits the screen (fit to screen, fill screen, 100% resolution). The SoundAlive audio-enhancing technology is available here too. Samsung droids usually have excellent video players, and although this one isn't the best among them it still does pretty fine. It can play 1080p videos, but sadly, it lacks support for MKV files. It sticks to MP4 and AVI (some XviD files didn't play smoothly). The video player lets you tweak the viewing experience out of the screen by adjusting video brightness, Auto play next, play speed, SoundAlive and enable subtitles. The Samsung Galaxy Grand did win some points for its subtitles support. It scans for all subtitles, so the file doesn't have to have the same name as the video file. The Galaxy Grand is equipped with an FM radio with RDS too. The interface is simple - there's a tuning dial and you can save as many as 12 stations as favorites. You can also play on the loudspeaker, but the headset is still needed as it acts as the antenna. You can record radio broadcasts as well. 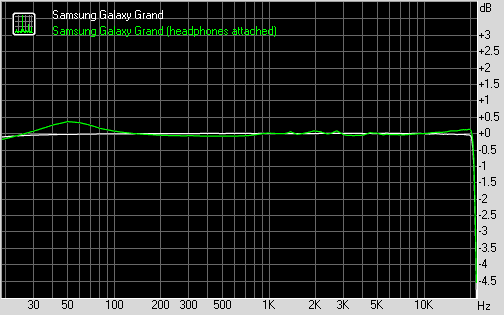 When connected to active external amplifier the Samsung Galaxy Grand managed very good scores all over the field, with the only average volume levels the only thing that might make you frown. There was some degradation when we plugged in a pair of headphones, but nothing too bad. Some distortion crept in and the stereo crosstalk worsened, but none of those will be easy to detect with the naked ear. The volume levels remained only average though, so while it's a solid overall performance it's not the best we have seen.